Record numbers of students from China and Hong Kong are applying for places at British universities, overtaking the number of applicants from Wales, according to official figures. 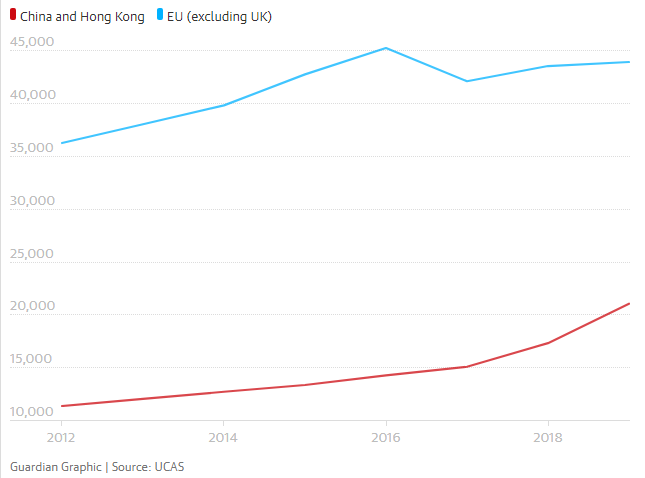 Data from the Universities and Colleges Admissions Service (Ucas) shows a spike in demand for undergraduate places from mainland China and a small rise in applications from the EU, despite fears over Brexit. The figures taken from Ucas’s January deadline, when the bulk of undergraduate applications are made, show a 1% decline in UK applicants, but a 9% surge from international candidates meant the total number of applications went up for the first time in three years. The number of applications from China and Hong Kong rose from more than 17,000 last year to 21,000 this year. In contrast, only 18,850 applications came from Wales, meaning that if those trends are sustained there will soon be more undergraduates from China studying at British universities than from Wales. Last year there were also more than 100,000 postgraduate students from China and Hong Kong at British universities, out of nearly 350,000 full-time postgraduates. Overall the numbers will come as a relief to the higher education sector, after widespread concern that the Brexit crisis would erode applications from within the EU and outside Europe. “It is very welcome news that students from the EU and China continue to see UK universities as top world class destinations,” said Chris Skidmore, the universities minister for England. British universities have redoubled their recruitment efforts overseas, while for European applicants it may be their last chance to access lower tuition fees and student loans before Britain exits the EU. International students from outside the EU generally pay much higher fees and are not eligible for loans from the UK government. Alistair Jarvis, the chief executive of Universities UK, which lobbies on behalf of British universities, said despite the latest figures the UK risked falling behind rivals such as New Zealand. “We are calling for a new graduate visa that will make the UK more attractive to international students, allowing a wider range of employers in all parts of the UK to benefit from access to talented graduates from around the world,” Jarvis said. Application rates from within the UK also appear to have defied predictions of a fall-off driven by rising student debt. Despite a 2% fall in the number of 18-year-olds in the population, the proportion from that age group applying to university jumped to nearly 39% in England, while in Wales there was a rise to above 32%. Copyright © 2016. 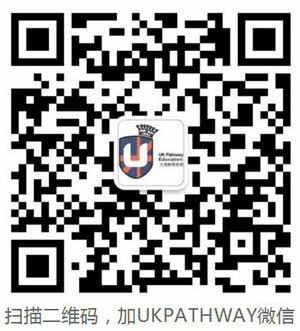 UKPathway Consultancy Group.